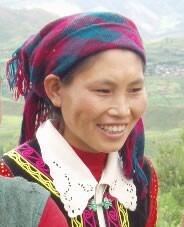 The Xiaoliangshan Nosu are ethnolinguistically related to the Shengzha Nosu in southern Sichuan. Most still call themselves Nosu, and their women's dress and large headdress are similar to what Shengzha Nosu women wear. Xiaoliangshan means "smaller cold mountains" - the primary habitation of this group. The Nosu in Sichuan live in the Daliangshan (Greater Cold Mountains). 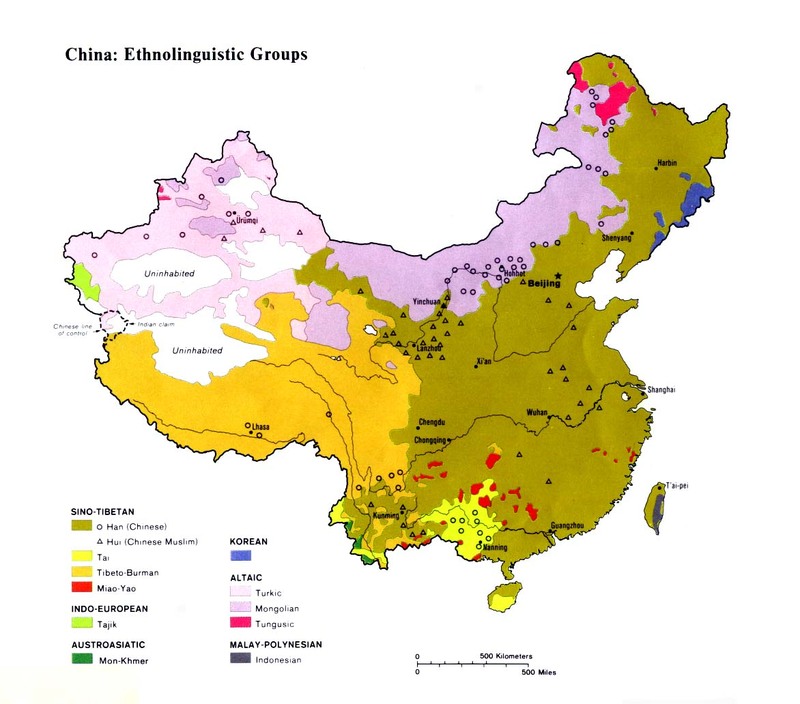 There may be several subgroups among the Xiaoliangshan Nosu. The Xiaoliangshan Nosu came from the Daliangshan in Sichuan at various stages of their history. The first migration began in the sixth century. Large numbers migrated after the defeat of Yang in 1730. Others followed after Chinese raids in 1802, 1814 and 1839. The Xiaoliangshan Nosu continued the practice of slavery that was the hallmark of their lives in the Daliangshan. After Communism, 10,000 slaves were liberated from Xiaoliangshan Nosu villages in Ninglang between October 1956 and March 1958. Prior to 1949 the Xiaoliangshan Nosu practiced a system of slavery. 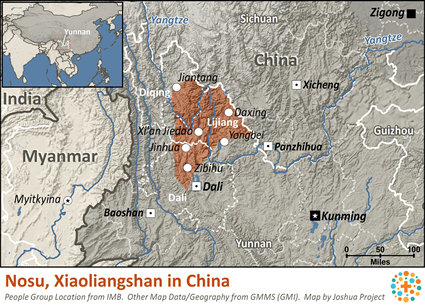 "Even today, Xiaoliangshan Nosu society is a very complex system of castes, tribes and clans. In northwest Yunnan there were four classes of Nosu - Nuo, Tunuo, Gajia, and Gaxi. The Nuo were the highest caste of landlord and slaveowner. The second tier of the caste system, the Tunuo, made up 54.5% of the Nosu population. The final two classes, Gajia and Gaxi, were 43% of the total Nosu population. The Nuo held sway in the daily affairs of the Tunuo and had absolute power over the lives of the Gajia and Gaxi - frequently taking them as slaves. In 1957 80% of the Nuo were slave owners. The remnants of these class tensions are still an undercurrent in Nosu society today." A combination of polytheism, animism, and ancestor worship dominates the religious life of the Xiaoliangshan Nosu. There are only a few Xiaoliangshan Nosu believers scattered over a widespread area. They are often in mixed congregations with Han Chinese or Bai believers. Few Xiaoliangshan Nosu have ever heard the gospel. Samuel Zwemer once asked, "Does it really matter how many die or how much money we spend on opening closed doors, and in occupying different fields, if we really believe that missions is warfare and that the King's glory is at stake?" The widespread geographic area of the Xiaoliangshan Nosu has hindered efforts to see a strong church planted in their midst. View Nosu, Xiaoliangshan in all countries. Location in Country: More than 439,000 people belonging to the Xiaoliangshan Nosu group inhabit twelve widespread counties in the northwest and northeastern parts of Yunnan Province, including Lijiang, Dali, Zhongdian, Deqen, Weixi, Huaping, Yongsheng, Ninglang, and Yuanmou. In some locations the Xiaoliangshan Nosu live alongside the Bai, Naxi, Pumi, and Tibetans. The Xiaoliangshan Nosu also spill across into areas of southern Sichuan Province.